312 pages | 10 B/W Illus. 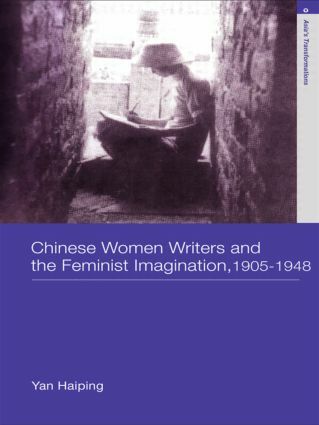 Chinese Women Writers and the Feminist Imagination, 1905-1948 provides a compelling study of leading women writers in modern China, charting their literary works and life journeys to examine the politics and poetics of Chinese transcultural feminism that exceed the boundaries of bourgeois feminist selfhood. Unlike recent literary studies that focus on the discursive formation of the modern Chinese nation state and its gendering effects, Haiping Yan explores the radical degrees to which Chinese women writers re-invented their lives alongside their writings in distinctly conditioned and fundamentally revolutionary ways. The book draws on these women's voluminous works and dramatic lives to illuminate the range of Chinese women's literary and artistic achievements and offers vital sources for exploring the history and legacy of twentieth-century Chinese feminist consciousness and its centrality in the Chinese Revolution. It will be of great interest to scholars of gender studies, literary and cultural studies and performance studies. Yan Haiping is University Professor of Cross-cultural Studies and the Director of the Institute for Advanced Study in Media and Society at Shanghai Jiaotong University, China and Fellow at the Institute for the Study of Economy and Culture at Cornell University, USA.